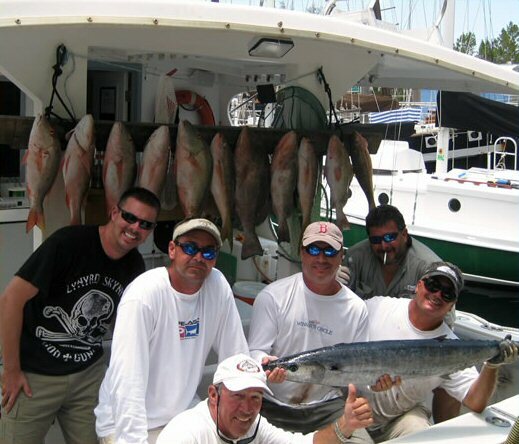 Key West, Dry Tortugas & Marquesas Keys FishingThe Florida Keys provide the most plentiful and greatest variety of fishing in the world, no matter if we’re trolling, deep sea , gulf and bay or reef and wreck fishing, there’s always a great catch awaiting you out there in the beautiful clear blue waters of the Florida Keys. Key West, Dry Tortugas & Marquesas Keys FishingThe Florida Keys provide the most plentiful and greatest variety of fishing in the world, no matter if we’re trolling, deep sea , gulf and bay or reef and wreck fishing, there’s always a great catch awaiting you out there in the beautiful clear blue waters of the Florida Keys.Fish such as sailfish, marlin, kingfish, dolphin and whoo, the real tough exciting fighters, can be found with our experienced Captains and professional guides as we troll along leisurely, or hook into a large grouper or snapper that seem to like to hang out and feed at the bottom just off of the reefs and around the wrecks as we anchor to settle in for a few hours of relaxation. Either way you can enjoy your fresh catch at one of our local restaurants where the chefs will prepare it for you to your liking or use our pack ‘n’ ship service to have your catch delivered fresh to your doorstep.